Peace neon custom sunglasses are favored by fashionistas and advertisers who wish to implore new style statements. Advertisers can always order them in bulk and gain benefits of improved persona, increased visibility, free art set up and discounts. This sunglass makes a good business gift during special occasions and otherwise. 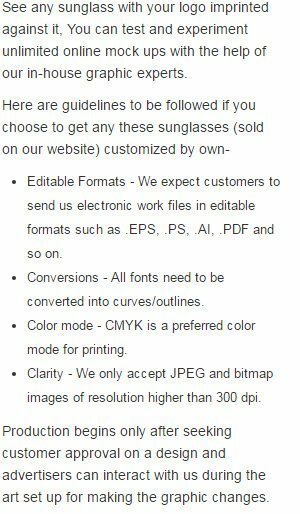 Peach neon custom sunglasses are offered in 4 colors and advertisers can always seek them for special promotions.